Here’s another quote from Jen’s Blog. 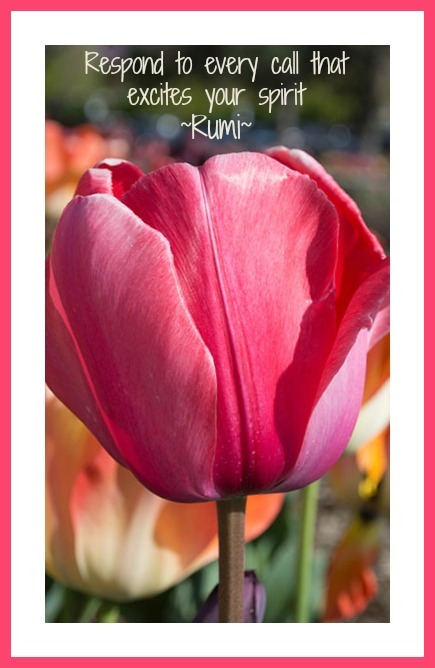 I wasn’t sure who Rumi was…so in case you aren’t either…you can check out this Wiki Article. However, I must confess, if I immediately responded to everything that excited my spirit, I might not get anything accomplished. So, people – if you’re like me…be responsible in your responding…but DO respond! :o) Have a terrific day! This entry was posted in Uncategorized and tagged excites, photography, pink, Rumi, tulip by explorenewness. Bookmark the permalink.